Character. Cost: 1. STR: 1. 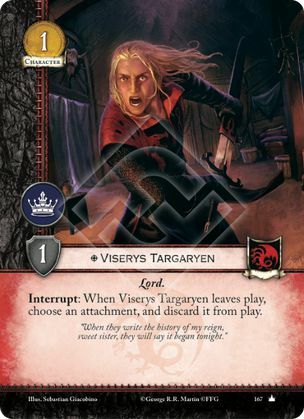 Interrupt: When Viserys Targaryen leaves play, choose an attachment, and discard it from play. "When they write the history of my reign, sweet sister, they will say it began tonight." As with all Interrupts, Viserys' ability is triggered and resolves before whatever it is interrupting resolves. This means that whatever attachment is chosen and discarded by Viserys leaves play before Viserys (and any character leaving play at the same time in the case of Marched or Wildfire) leaves play. So if Viserys and a Robb Stark with Ice attached are both Marched, Viserys can discard the Ice before Robb is discarded. So Ice moves to the discard pile, not it's owner's hand. If multiple characters are killed simultaneously (e.g. by Valar Morghulis), you cannot trigger Viserys to discard a Bodyguard before your opponent can use it. "Would" interrupts have priority over non-Would interrupts (see The word "Would"), so saves are triggered first, before any "when killed / leaves play" interrupts.